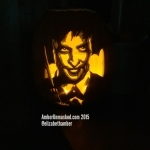 2015 PUMPKIN CARVINGS BY AMBER LOVE! 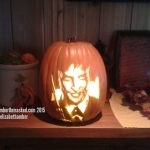 AMBER LOVE 18-OCT-2015 If you ever took a gander through my Pumpkin Galleries before, you’ll see not all of them have specific instructions. 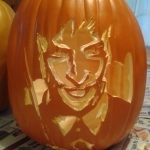 This is because the “How To” carve instructions are the same for most of my greyscale patterns. 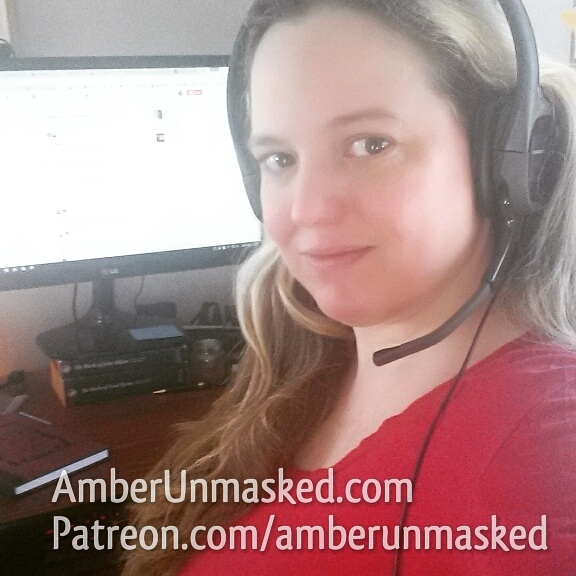 Sponsor my creative content at Patreon.com/amberunmasked. *PS – I say “my” loosely because I am no artist; I have to start with other people’s art and then rework it in GIMP to make usable patterns for carving which are then “my” patterns in the sense that the original photographer/artist/model didn’t have anything to do with that step. Despite the idyllic photos of the Country Fresh Farm in New Jersey, my pumpkin carvings almost always fake pumpkins. They’re made of foam and purchased at craft stores like Michael’s. 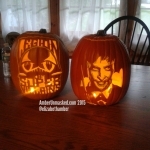 One year I used official “Funkins®” and found them to look nicer but were much harder to cut. 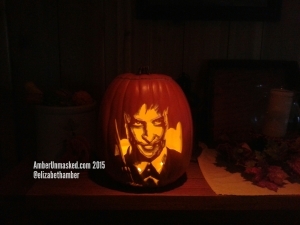 Coincidentally, the foamkin I got from Michael’s this year (for the Penguin) was just as hard to carve as a Funkin. The Legion of Super Villains foamkin was used on last year’s stock. I normally go to Michael’s to stock up once the pumpkins are 50-60% off because I don’t need to spend $30 on a pumpkin I know I can get for $12 in a couple of weeks. 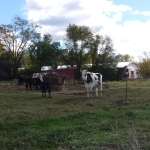 And we saw the largest bull and pigs at the farm! 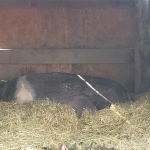 John Henry the pig is 1,000 pounds. 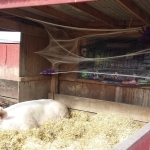 No idea how much Gunner the pig weighs. The bull stood probably taller than I am (5’2″) but I didn’t want to get close enough to find out. 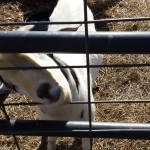 I got to see goats, which I love. Goats are cool. 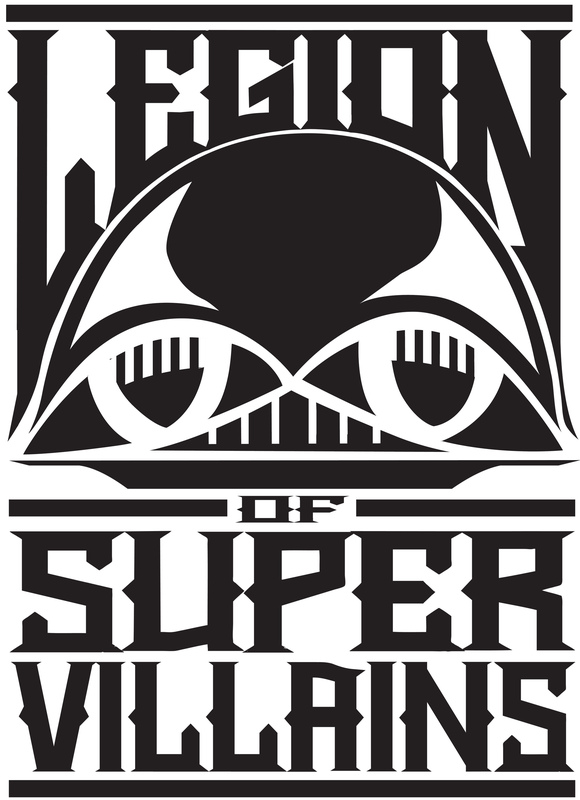 The Legion of Super Villains is a costuming troupe started by my friend and AmberUnmasked.com contributor, James Hannon. 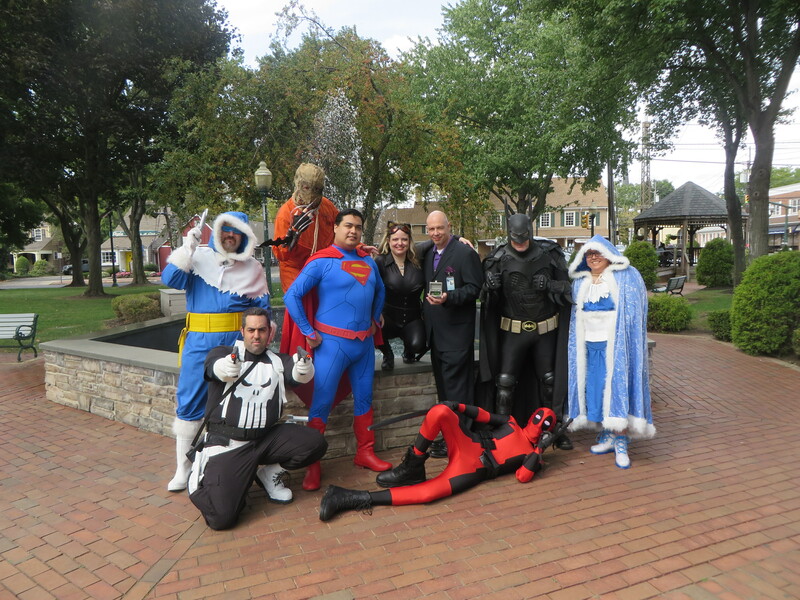 If you meet us at an event like a comic con, comic shop party, or a charity event, James will tell you all about the different characters and who we are. We’re real people, I swear. 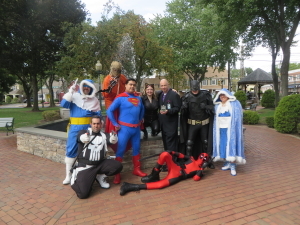 If you’re interested in cosplaying with a group, this is a great place to start. Sometimes it helps to be surrounded by like-minded weirdos. Let’s just say I owe James A LOT for all his support over the years personally, professionally, and with all our charity work. He’s aces. 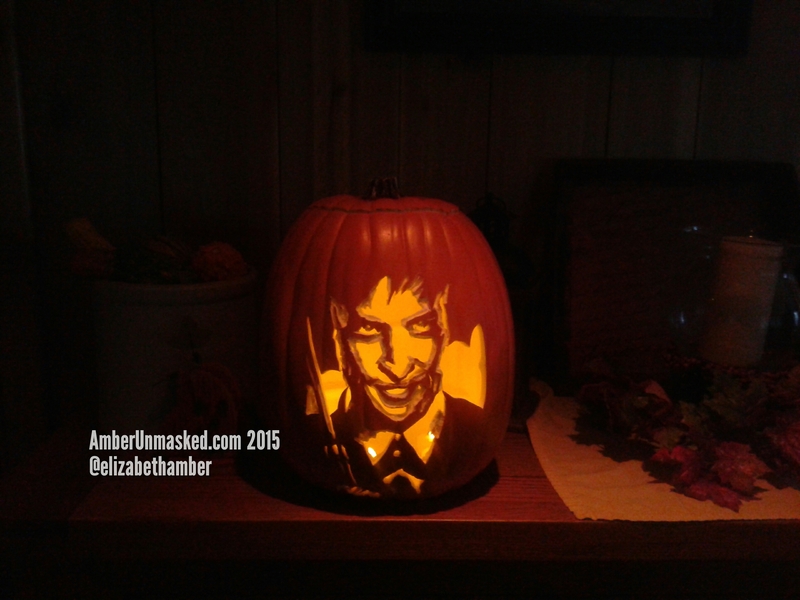 So as a Thank You, I wanted him to receive one of this year’s pumpkin carvings. (Almost all my pumpkins have been given as gifts). 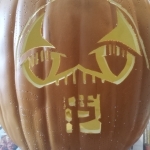 For the LoSV pumpkin, I spent about an hour in GIMP (opensource Photoshop) to rework the official logo. Why? 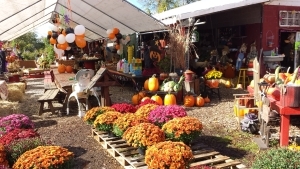 Because you need to make sure that all the solid pumpkin pieces are anchored and not completely surrounded by cut out space – unless you have a trick to defy gravity. 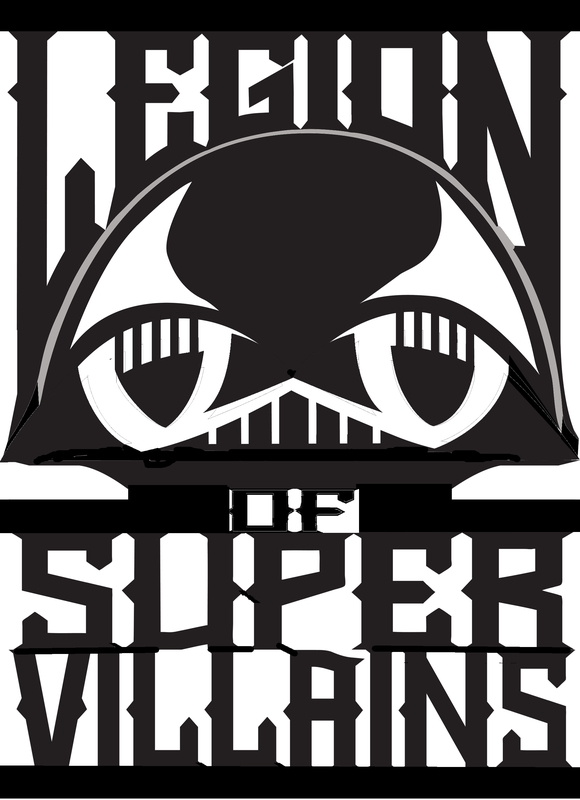 Since the LoSV was a black and white logo, there was no third shade. 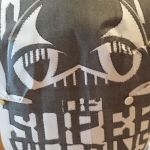 I added one in the shine on the “dome” of the design. It could’ve been cut all the way through, but I opted to have one shaded area. Carving time on the LoSV pumpkin was somewhere around 3.5-4 hours. KEEP THE PATTERN NEARBY FOR REFERENCE. BEGIN CUTTING FROM THE CENTER. MAKE SURE ALL FLESH SHAPES ARE ANCHORED TO OTHER FLESH. DREMEL THE PARTIALLY CUT/SHADED AREAS IF POSSIBLE. Batman used to be my favorite character and sometimes, I still say he is. But then I get annoyed and think there’s way too much Batman in the world and not enough other characters. I’ve answered the question, “who is your favorite?” a number of different ways over the years: Wonder Woman, Sue Storm, Rogue, Firestar, Betty from Rat Queens, Athena Voltaire, and on and on. Here’s the thing: the Penguin would never have been on that list. Not until GOTHAM aired. Whoa, baby! 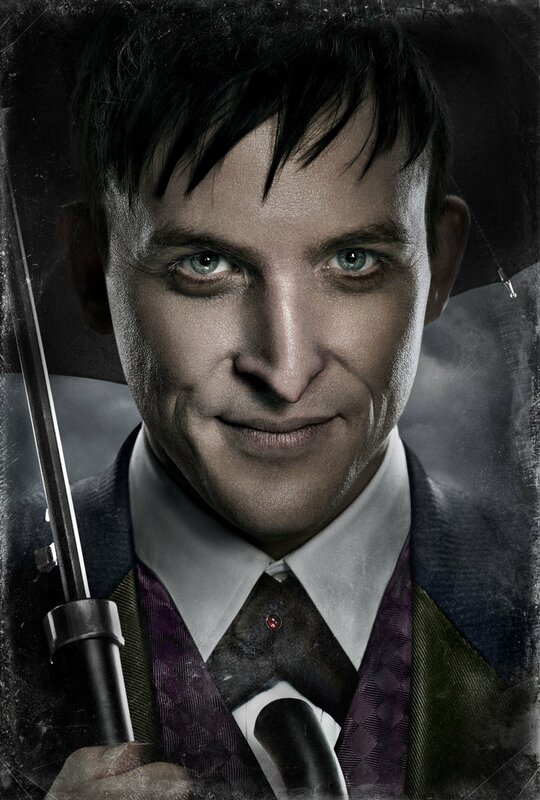 Let me confess my love of Robin Lord Taylor’s version of the Penguin. I LOVE LOVE LOVE HIM. I never found the character that interesting. He was a villain, but he was a mobster who kept his hands clean so nothing ever really happened to him. 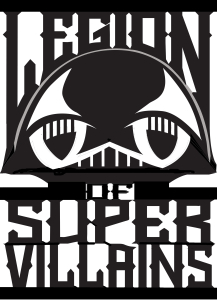 I kind of liked the version from The WB cartoon, The Batman (the one with the theme by the Edge). The best thing I could say about the Penguin previously was that he was visually interesting. But now, Taylor’s version is even more visually appealing. Okay, besides the hot guy appeal, they do a phenomenal job as a team creating this Penguin. The hair, the clothes, the makeup, and then the performance. The entire first season of GOTHAM could’ve been renamed PENGUIN & FISH, because I have just about the same love and admiration for Fish Mooney, a character and actor (Jada Pinkett-Smith) that I didn’t expect to like at all. I’d watch a show just about them. 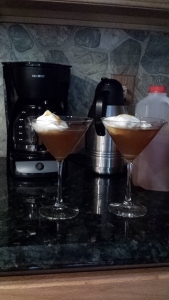 You need a design to begin with. If you’re an artist, great. If not, you have to do what I do and find an image that could be tweaked. 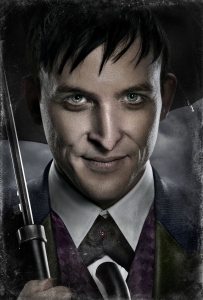 In GIMP, I take an image like the GOTHAM promo photograph of the Penguin and do a few things to it. Gaussian Blur to 10 in this case. Played with the brightness and contrast until the shapes of the shadows and highlights were stark. Adjusted curves to balance the shadows, highlights, and midtones so there would be some grey/mid areas. Reduce saturation. Depending on the image, you can go to Posterize and choose “3” colors without this much work. But, eventually, you’ll get to Posterize-3 and have an image of black, white, and grey/midtone. Depending on the image, you might need to switch to the Negative view so that the black and white are reverse. 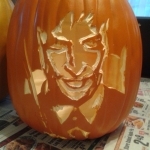 It all depends on which pieces you want as pumpkin flesh and which pieces will be cut out for the light to come through. 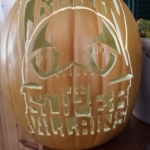 Remember, your pumpkin will have curves. You’ll need to adapt as you go because some lines are going to get messed up. 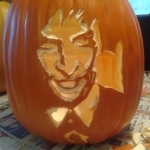 Clean the pumpkin if it’s a real one. 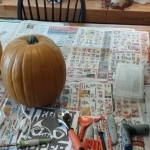 If you’re using a craft pumpkin, you’ll still want to cut the top off so that you can empty the scraps and eventually put the flameless candles in. 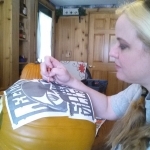 Pin the pattern to the surface of the pumpkin. 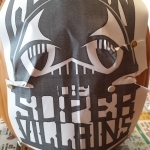 Using a push pin or the tool provided in the Pumpkin Masters tool kits, go around every black, white, and grey shape in the pattern. If the paper isn’t lying flat, you’ll need to make adjustments. 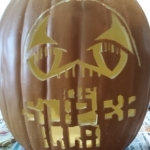 Remove the paper from the pumpkin but keep it nearby because you’ll rely on it to see which shapes are to cut out completely and which are to cut out partially. The grey shapes are the ones that you only cut halfway through leaving some of the flesh/foam. The white shapes are the spots you cut out completely. 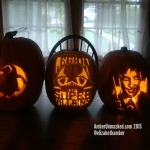 The black shapes are untouched pumpkin. WORK FROM THE CENTER OUT. GOT THE FACE & CLOTHING DONE. ADDED UMBRELLA HANDLE. Begin at the center and work your way out. I had a difficult time with certain areas like the eyes. If that happens, just adjust as you go along. 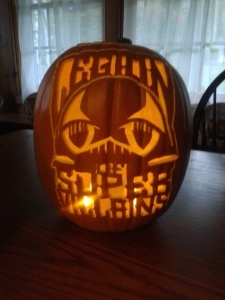 My finished carving isn’t a 100% match for the pattern because of adjustments made on the fly. Just like the notes/captions above on the LoSV design, you continue to make adjustments. 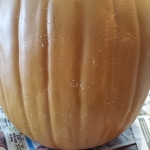 If something breaks off with the foam pumpkin, you should be able to hot glue it back into place. I’ve never tried. I just figure out a way to work around the problem area. 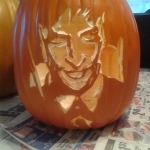 With a real pumpkin, you can try anchoring with toothpicks; I tried that on my first comic book pumpkin which was Elektra, one of the few real pumpkins I’ve ever carved. Use a small Dremel bit to refine some of the shaded areas. 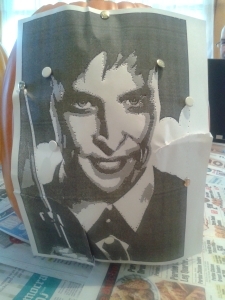 Carving time on the Penguin pumpkin was about 2 hours (also with one hour or so in GIMP). Add battery-operated, flameless candles. Put the top back on. Turn off the lights. And you’re all set! #Spoopy!